If you have suffered personal injury following a slip or trip that wasn’t your fault you may be able to make a personal injury compensation claim. Our experienced solicitors are ready to help you. Call us on 0800 808 9740 or get in touch online to find out if you have a valid claim. If you have been injured after slipping or tripping in circumstances that weren’t your fault you should immediately contact personal injury solicitors with experience in this area. Often claims in this manner can involve legal intricacies, so to stand the best chance of securing the compensation you deserve it’s vital you seek the help of expert solicitors. In order for your claim to be successful, it will need to be proven that someone was at fault for your injuries. For example, if you slip on a wet surface in a supermarket, there will only be liability on the part of the supermarket if there was no sign. If there was a sign it would be assumed that a reasonable person would not walk there, or would take more care. In relation to a claim against a local authority following a trip on a paving slab or pothole, for the claim to be successful it would need to be proven that the stone was sticking up by an inch or the hole was the same depth. If for example, a floor is wet, or a paving stone dangerously uneven, there will only be a liability if those circumstances have existed for a period of time beyond which warning signs should have been placed, or the problem rectified. First Personal Injury has built up a reputation across the United Kingdom for their approach in personal injury claims. Working with members of the public who have had personal injuries, First Personal Injury exceeds customer expectations. Contacting First Personal Injury is free by calling 0800 808 9740 alternatively by filling out the online claims form. How much compensation for a slip depends mainly on the extent of your injuries. There are a range of different kinds of injury you can sustain following a slip. Below are some of the most common kinds of resultant injury and the level of compensation you can expect. 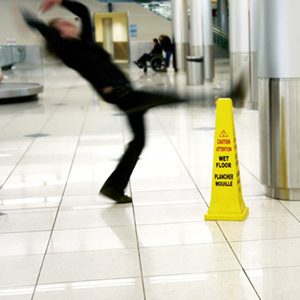 A number of potential injuries could be caused following a slip, trip or fall. The following information intended as a guide to those injuries and the levels of compensation. Injuries to the face can often involve disfigurement or scarring which will be factored into a compensation amount and there may also be psychological damage. If you would like more information on how much compensation for a slip then please get in touch with us today and our team will be able to speak to you more about your specific details. Call us on 0800 808 9740.